Mystic Seaport’s replica of Nantucket’s Brant Point Light proudly houses “Sentinels of the Sea,” an exciting multimedia exhibition recounting the history and diversity of lighthouses from around the country. Surrounded by a panorama of five LCD screens, two short films celebrate these iconic structures with stunning footage and moving images. From the Revolutionary War era to the advent of GPS, American lighthouses were imperative to the safety and survival of an untold number of ships and sailors at sea. Hear as first-hand accounts from keepers and their families relay some of these stories of survival, as well as the difficult and sometimes perilous duties of a lighthouse keeper. Mystic Seaport is also a proud participant of the United States Lighthouse Society’s Passport Program. Purchase your passport at the Museum Store, receive a one-of-a-kind stamp at the Visitors’ Reception Center, and get started on your lighthouse quest today! Located on the southwest point of the Museum grounds, this replica of the Brant Point Lighthouse on Nantucket was built in 1966. When the first Brant Point Light was built in 1746, it was the second operative lighthouse in New England (the first being Boston Light dating from 1716). 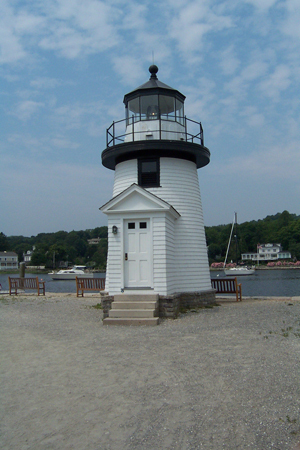 The wooden tower, built in 1900 and on which Mystic Seaport’s replica was modeled after, is the lowest lighthouse in New England with its light only 26 feet above sea level. Like the original on Nantucket, which has a 1,300 candlepower electric light and is visible for ten miles, the Brant Point Lighthouse replica contains a fourth-order Fresnel lens. Developed in France during the 1830s, the Fresnel lens, which efficiently focuses light to create that strong beam of light that characterizes lighthouses of today, was one of the most significant developments in lighthouse technology. The lighthouse has been a significant device for identifying harbors and warning sailors of dangers since ancient Egyptian times and have gone through a long evolutionary process, beginning with burning piles of wood, then using whale oil lamps for illumination, and culminating in the present automated, electronic lighthouses.